Things like the pledge of allegiance, presentation of colors and the national anthem took on special meaning Monday morning at the Santa Barbara Cemetery. The added meaning — the fact that it was Memorial Day — brought tears to the eyes of many gathered for an annual ceremony at the final resting place of generations past. Hundreds spent their federal holiday off from work at the Memorial Day commemoration on a hill overlooking the American Riviera and the Pacific Ocean, honoring the sacrifices of those men and women in the armed services who lost their lives in the line of duty. “Our debt to them is eternal,” said retired U.S. Marine Corps Brigadier General Frederick Lopez, who served as master of ceremonies for the event organized by the Pierre Claeyssens Veterans Foundation. He and other speakers at the ceremony featuring bagpipers, vintage war flyovers, singing and more remarked on the large size of the crowd as a testament to fallen heroes and the veterans and military families present. Memorial Day originated in 1868, Lopez said, as “Decoration Day” in Arlington Cemetery as a time to adorn graves with flowers and flags to honor servicemen and women who lost their lives in service of freedom. Thousands of colorful flowers, wreaths and miniature American flags were strewn Monday for the same reason — respect. 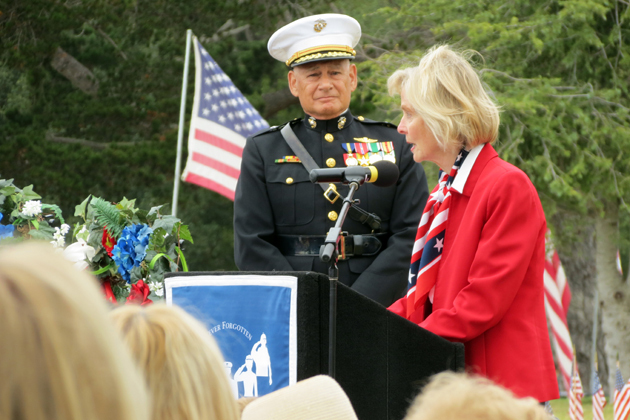 Rep. Lois Capps, D-Santa Barbara, asked that local residents continue to honor veterans by giving them top-notch care after they return home — a cause she champions in Congress. “I believe the greatest way to honor our heroes is to take care of them,” she said. Vandenberg Air Force Base Commander Col. Keith Balts served as the keynote speaker, explaining that he represents 3,500 airmen at the Lompoc base. Balts said the number of people in attendance encouraged him. He told stories about some of the Santa Barbara County servicemen who lost their lives in recent years. The crowd gathered on the gray morning reserved especially loud applause when Lopez recognized veterans from each war, asking them to identify themselves to receive their thanks. Acknowledging their service was important, he said, lest we forget their sacrifice.